Join the discussion on our forums! 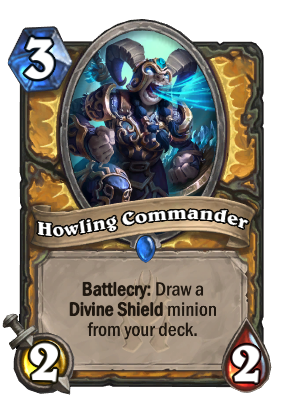 Come discuss Howling Commander over in our dedicated Howling Commander discussion topic. Comparing this to Arcanologist it seems very bad, but that may just be Arcanologist being way too good. Statline and effect are very similar to Kabal Courier, which is never used in paladin, so I dont know if it's viable. It's interesting, but not sure if it can play on curve considering the lack of Divine Shield minions in the 4-5 mana range. Most of them are low cost like Argent Squire or high like Argent Commander or Sunwalker. Still a pretty good card though. So ... why doesn't this card have Divine Shield? You would think that for a "commander" this card would have slightly better stats. Great card...good in control...divine favor replacement in divine shield aggro. This card is amazing. This is good like real good!